When all is said and done, building a business is not rocket science. But you must reach out and build meaningful relationships by being very clear about who you are, what you offer and how you offer it. Please do not confuse this with networking. To succeed at creating a business that reflects your passions, you must go to your clients and connect with them. The method you choose must suit you. Otherwise, you won’t do it or you ll do it with limited success. Imagine five doorways, each with a distinct purpose for connecting with people. Take out a paper and a pen and draw the doorways. As we go, write notes in each one. It will get the ideas out of your head and help focus in ways that reflect your unique approach. If you’re like me, you would rather get a rabies shot than go to networking events. Yet, building a community of business is central to success. In this doorway, instead of thinking about where you “should” go, write ways you already connect with people or ways you’ve connected in the past that come easily to you. Write down places or situations where you enjoy connecting. Write down how you stay informed. What Internet sites? What magazines or papers? What is your favorite radio station? Online publications, newspapers, radio shows and magazines need people to write or speak. By using the media you enjoy, you connect with prospective clients that have similar interests and values. You might notice that these first two doorways are about you. We so often forget that being successful in marketing means honoring how you interact in the world. Once you start writing or speaking, you’ll gain confidence and credibility. And you’ll meet people who want to know more about what you do. Write down your favorite “information highways,” and in a word or two write why you like them and what articles or programs you d like to offer. What’s the key? Trust that you have something important to share and you have a unique approach just by being you. This third doorway is my favorite: Who? The traditional model promotes choosing customers by their demographics. My approach- I identify the qualities of people. I love working with independent, creative, highly motivated people building businesses they re passionate about. When I go into a room I immediately gravitate to them and vice versa. It s fun, natural and enjoyable. Write down who you enjoy being with. Use adjectives. Think about the people you enjoy. Describe them. What we often forget is that people hire people they can relate to. Once you’ve decided the “who,” this doorway addresses your customer s needs. At this point, it is all about them. WHAT do they want? What do they really, really want? Choose three people from your who doorway. Think about them. Write down what. What programs, products, seminars or booklets do you offer to serve their needs? People like to test the waters before they dive in. If you give them a chance to sample what you do, they can safely test you out before investing their time and money. This last doorway asks you to identify the skills, support, and resources you need to connect most effectively with your potential customers. It may be technical skill, referral partnerships or ways to fine tune your presentation. Be honest. Write your needs list. Keep it simple. Now that you’ve created a brain storm of ideas, circle one or two you are willing to take action with today. What is one call you can make? One email you can write. And do so. Now. And remember typically, it’s not the skill-set that people lack, but the courage to reach out and connect. To succeed at creating a business that reflects your passions, you must go to your clients and connect with them. 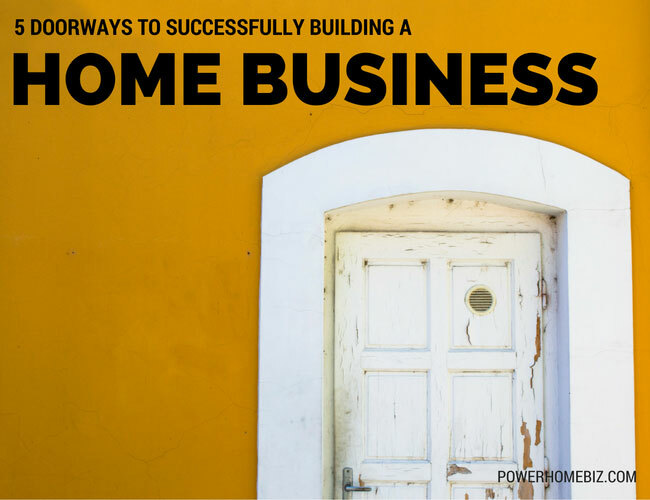 Learn the 5 doorways to successfully building a home business.